1. Figure out what your essentials are- they should include a bed and a dresser, couch, a TV and something to put it on, and a kitchen table with 2 or more chairs. 2. Set a spending allowance and assign what needs to be bought first and what can wait till later. 3. Browse all the furniture stores in your neighborhood, then go outside of your area and see how the prices fluctuate. The products downtown might be just as good as the ones out of downtown, but they’ll most likely come with a higher price tag. 4. Surf the internet, look up all your local department or furniture stores and see what they are advertizing. You might come across places that are stocked with the same merchandise in stores as online. Once you enter a store, ask if they price match. 5. Shop at IKEA, but be extremely choosy. You can discover very sensible furniture at inexpensive prices here; however, not everything is suitable. Select items that are sturdy and put back second-rate stuff. This is also a great place for décor, knick-knacks, candles, pillows, and even bedspreads can be purchased here for less. 6. Check out bargain brands or outlet malls, they are usually overflowing with discontinued well priced items, including cutlery and flatware. The furniture might have minor nicks or dents and because of that are typically discounted a great deal. The savings compensate for the flaws. 7. Scan the FREE section on Craigslist; people throw things out all the time. You might be lucky enough to find a nearly brand new piece of furniture. 8. Thrift stores that are situated in or around expensive neighborhoods often sell gently used decent quality furniture at good prices. Keep your eye open for solid wood pieces, or silver that can be polished and used to decorate. 9. Garage sales can gross out some people, but if you see one, take a quick survey of it. You never know what you might spot, only consider clean and well maintained products. 10. Reuse, reduce, recycle. Got a postcard with a picture you adore? Buy a frame for it from the dollar store and hang it as art. These are 10 basic ways you can furnish your apartment on a small budget. 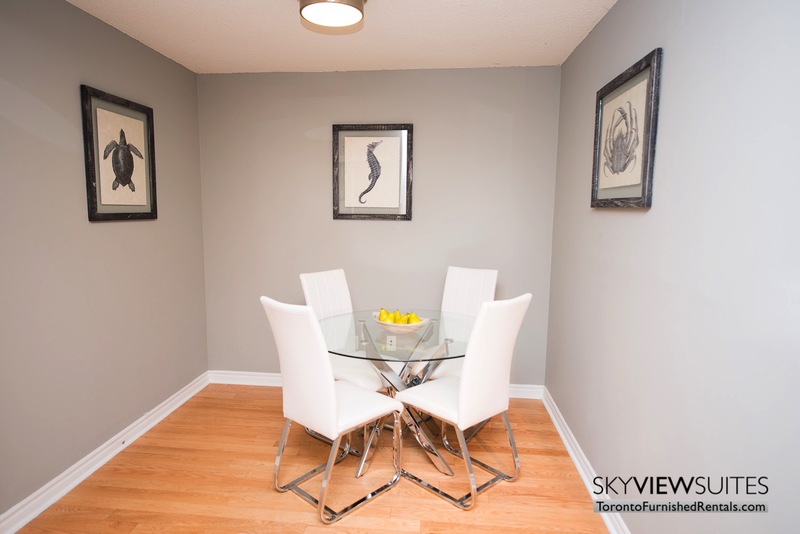 If you haven’t got an apartment yet and need a place to stay, SkyViewSuites can help. www.torontofurnishedrentals.com offer comfortable units that you can rent while you search for your own apartment to furnish.